Find out a little more about the Bridge12 products available through TalaveraScience! Bridge12 manufacture high field EPR/ESR Instrumentation including accessories for solid state DNP NMR and Overhauser DNP. TalaveraScience is the Senior Sales Consultancy for Client throughout Europe, the Middle East, India and Australasia. Bridge12 was founded more than a decade ago by Dr Jagadishwar Sirigiri and Dr Thorsten Maly both former scientists from MIT with extensive experience in high-frequency terahertz (THz) sources, such as gyrotrons, microwave technology and magnetic resonance spectroscopy. Bridge12 provides THz/microwave technology including: active and passive components such as gyrotrons and transmission lines for Dynamic Nuclear Polarization (DNP) enhanced NMR spectroscopy; turn-key high-frequency (>100 GHz) Electron Paramagnetic Resonance (EPR/ESR) systems; Overhauser DNP (ODNP) upgrades for any X-Band (9 GHz) EPR spectrometer. Bridge12 products find their application in magnetic resonance (EPR/ESR, DNP and NMR) in both academic research and in industrial research and development. Bridge12 has supplied instruments and other products to research groups across the United States of America and elsewhere in Japan, South Korea, Germany and Israel. Bridge12’s research and manufacturing facility is located near Boston in Framingham, Massachusetts, USA. Please contact info@talaverascience.com or pjonsen@bridge12.com for further details. 395 GHz cw/pulsed EPR system based on a 14.1 T cryogen-free superconducting magnet with or without iVTI. These systems are fully supported, integrated and complete EPR spectrometers (no more do you need to worry about the departure of the group member who knows everything about the spectrometer). The cryogen-free magnets integrated with the system are manufactured by Cryogenic Ltd (for more information concerning these magnets, please view my Cryogenic Ltd web page http://www.talaverascience.com/tsCryogenic.com) and are fully sweepable magnets (from one maximum field polarity to the other) under the Bridge12 EPR spectrometer control. EPR spectrometers operating at more than one of these frequencies is also possible (or with a bespoke frequency, see below). If you already have an appropriate magnet the Bridge12 high field EPR spectrometer 'electronics' can be provided to combine with your existing magnet and hardware. In addition, see below, the instrument can be added to existing hardware such as solid state DNP NMR systems to provide EPR spectrometer functionality in order to optimise the DNP experiment; please contact us to discuss. If you have requirements utilising high field EPR outside of these specifications (such as different/bespoke frequency ranges), please contact us to discuss them and it will be our pleasure to offer cost effective solutions! Bridge12 can also provide components for any HF EPR Instruments, Inc., 130 GHz: D-band cw/pulsed EPR systems you might have. Please contact us for details. Please contact us if you would like to receive further information at info@talaverascience.com. High field EPR Spectroscopy typically requires very expensive instrumentation including the spectrometer and a sweepable super conducting magnet system. Bridge12 have developed a cost effective high-field EPR spectrometer utilising state of the art microwave technology and quasi optics, pictured to the left, with its own integrated source to use an existing superconducting magnet to add: (a) the capability of EPR spectroscopy to existing gyrotron or EIK equipped solid state DNP NMR instruments, or; (b) EPR spectroscopy capability and low temperature DNP to existing NMR instruments. Solid state DNP NMR is all about gaining massive sensitivity gains to allow experiments that would be impossible by solid state NMR, alone. So, why would the researcher forfeit sensitivity by not optimising the experimental conditions. This EPR spectrometer is connected to the waveguide between the gyrotron/EIK and the solid state DNP-NMR probe using a Bridge12 provided kit which does not make any changes to the wave guide. This then allows the acquisition of the EPR label spectrum so that the optimal polarising agent can be selected and the determination of optimal conditions. You would like to add low temperature DNP and EPR spectroscopy to your solid state NMR instrument. 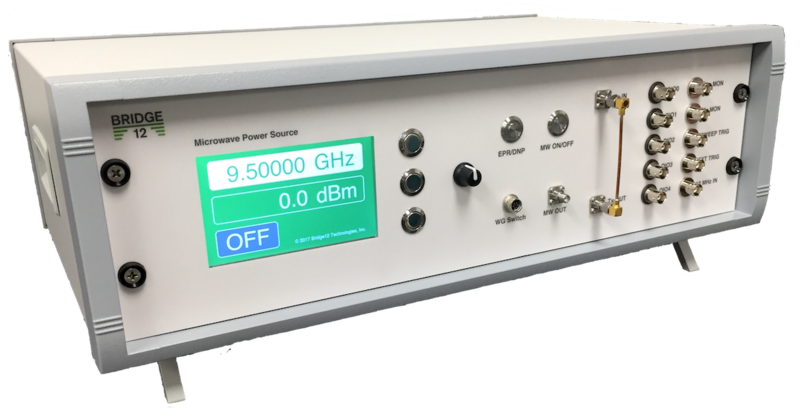 The cost effective solution from Bridge12 includes the high frequency EPR instrument and a microwave source for NMR frequencies up to 500 MHz 1H. Bridge12 provide a turn-key X-band Overhauser Dynamic Nuclear Polarisation (ODNP) Probe which is compatible with homebuilt or commercial X-band EPR instruments. Installable into standard X-band cavities such as the Varian E231 and the Bruker 4102ST, including all of the required parts. 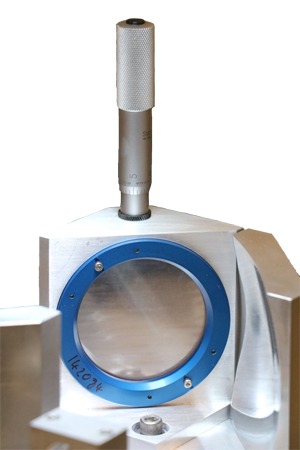 The probe is carefully designed to minimise any changes in the Q-factor of the EPR cavity and to minimise sample heating even with high microwave powers. The probe facilitates easy sample changing using the provided sample holders which are either: a 2 mm OD, 1 mm ID 0.84 mm OD, 0.6 mm ID capillary tubes. Requires an existing X-band cavity, examples of suitable cavities include: Bruker 4102ST, 4119HS, 4122SHQ, ER4123D or the Varian E231. Requires > 5 lpm flow of dry, clean air. Standard sample size: 2 mm. Standard NMR Operating Frequency: 14.5 (±0.5) MHz. Sample holder and probe mounts provided. Please contact us for any other frequencies, nuclei, sample tube diameters, etc. Solid state DNP NMR currently requires a high power source of microwaves and at high frequencies as determined by the NMR magnetic field strength. This requires a source such as the gyrotron which satisfies both requirements. to make a cost effective and scientifically competitive instrument. Bridge12 can provide a whole range of microwave components for you. 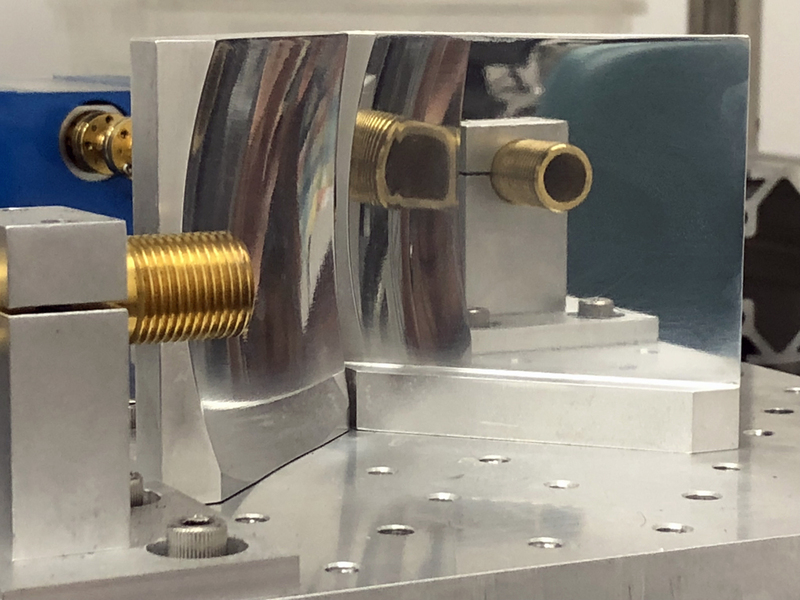 These include waveguides for EPR and DNP applications, microwave and terahertz sources (see picture below) and Quasi-Optical Components (the Bridge12 high frequency EPR instruments are modular and can be built up into an instrument or built in to an existing instrument). Do you know the exact frequency emitted by your GHz/THz source? Would you like to track the frequency during your experiment? 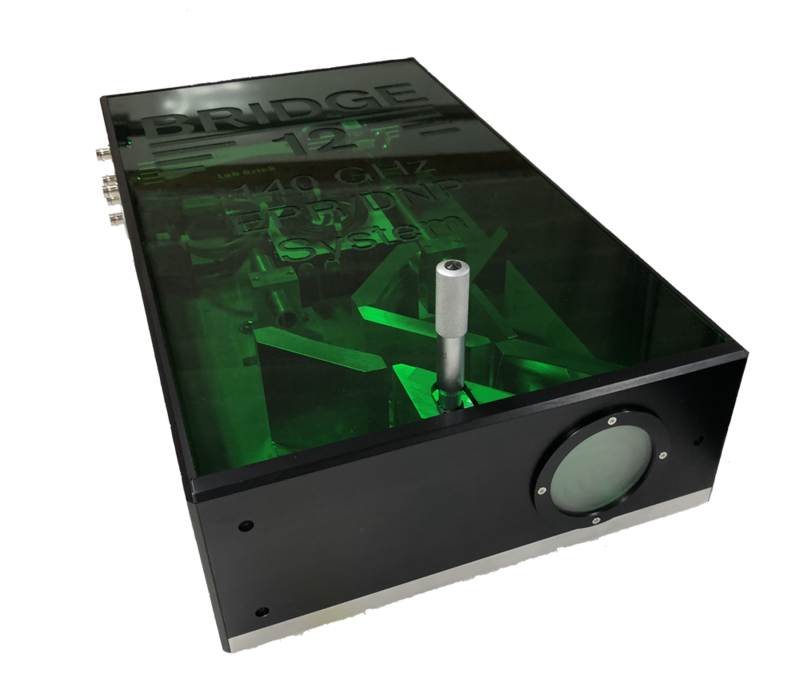 Bridge12 have the perfect instrument to do this and is ideal for troubleshooting solid state DNP NMR experiments; the Bridge12 Frequency Measurement System (FMS). The Bridge12 FMS is a well documented and supported turn-key frequency measuring system consisting of a heterodyne broadband receiver capable of measuring frequencies from 26 GHz to 500 GHz (depending on the input mixer). The Bridge12 FMS is conbtrolled through a simple software interface with two modes: measure and; track and can be installed on a gyrotron control system, the EPR spectrometer computer or a Windows-based computer. There are many heat exchangers using liquid nitrogen (LN2). Bridge12 Crogenic Heat Exchanger (CHE) has a design which prevents the exchange gas stream from liquifying (generating pressure and temperature instabilities) and allows for LN2 refilling without interupting the experiment based on a counter flow heat exchanger. The CHE design allows for a constant VT gas flow at the regulated temperature. The CHE LN2 reservoir is at atmospheric pressure so can be refilled at any time during an experiment and is insulated to optimise efficiency and minimise LN2 consumption. The CHE consists of a 50 litre dewar, the cryogenic heat exchanger, flow regulators, diaphragm pump, all required hoses and connectors, and a mounting plate.